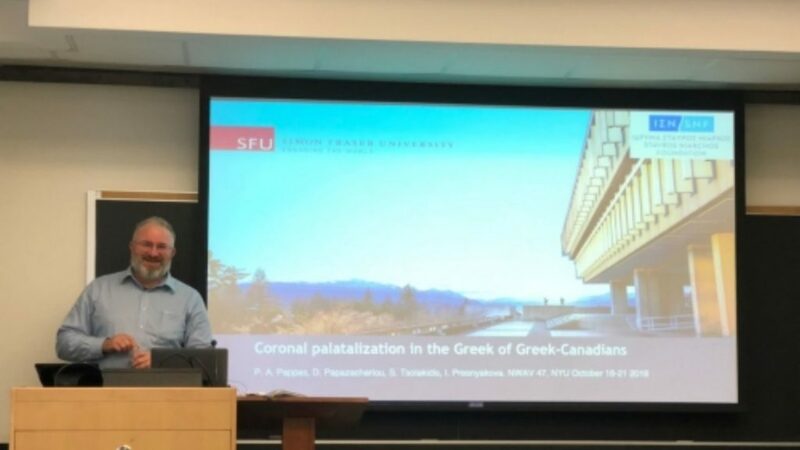 Interesting insights into the migrant experience in Canada will be offered by Associate Professor Panayiotis Pappas from Simon Fraser University in Canada during a lecture at the Ithacan Philanthropic Society on Tuesday, 16 April. The lecture, titled “The Immigrec project: Building a virtual museum of the Greek-Canadian immigrant experience”, will give Australian audiences a round-up of his project that aims to document the second wave of Greek immigration to Canada – roughly the period 1945 to 1975 – through the collection of oral histories and archival material, such as travel documents, photographs, etc., for the purpose of creating a virtual museum, and for research in history, political science, anthropology, and linguistics. The project has interviewed 453 participants from 12 different communities in Canada, and more than 13 different geographic regions of Greece, yielding an unexpected treasure trove of historical, anthropological, and linguistic data. He gave Neos Kosmos insight into his life and work, in the first person. The inspiration behind the Immigrec project was… Professor Ralli, the chief investigator (of the project) had studied in Montreal. During a visit in 2011, she noticed that the Greek imprint on the city was diminishing so she decided to document the history of Greek immigration before the first generation of the 2nd wave passed on. The greatest challenge for me has been… convincing the first generation Greeks to participate. It was the second generation (sons and daughters) that helped us recruit speakers, and who saw the value of the project. The most impressive legacy of the project has been… the virtual museum which will be ready in a couple of months. It will allow future generations of Greek Canadians to learn about the history of their communities. A story that sticks out most from my research has been… mail order grooms. I was surprised how many young men moved to Canada for marriage. Most of them only on the basis of a few letters and a single photograph. Something that Greek Australians will find particularly interesting… most Greek Canadians were also considering Australia as a possible destination. These two countries were the only real viable options for them. A commonality of the diaspora experience around the globe is… their continued love for the home country, and their sincere desire to be excellent ambassadors for Hellenism. During my lecture at the Ithacan Philanthropic Society… I will present a general overview of the project, discussing the organisation of our research efforts, our preliminary linguistic results, and showcasing some of the most exciting features of the virtual museum. Apart from the presentation, the visit is an opportunity for Dr Pappas to also meet with the faculty of Greek Studies of La Trobe University to share their methodology methods and explore the possibilities of collaboration. The visit is made possible by the Vassilogiannis Bequest, the generous gift to Greek studies left by the late Anastassios Vassilogiannis and takes place at 7pm on 16 April at the Ithacan Philanthropic Society (Level 2, 329 Elizabeth Street, Melbourne).